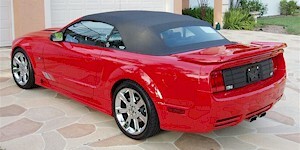 The 2005 Saleen conversions were done on the new body style Mustang GTs. You could get the base S-281 model, the S-281 S/C supercharged version, and the S-281 E "Extreme" model. The first two could be ordered in the coupe or convertible body styles. The Extreme model only came in the coupe. 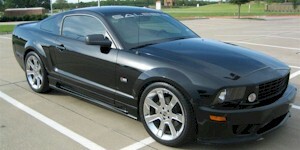 They came standard with the Saleen Quick Ratio 5-speed manual transmission. A 5-speed automatic was optional. Suspension included MacPerson strut, 1.38 inch front and 0.79 inch rear stabilizer bars, urethane pivot bushings, and a live rear axle. Standard were big 20x9 inch wheels all the way around. Optional 10 inch wide rear wheels were available.